MUSCAT Twenty members of the German Geological Society from various universities and research institutions are currently visiting the Sultanate of Oman. The German Geological Society runs the expedition the fifth time. 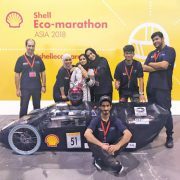 The idea to run fieldtrips and expeditions around Oman is based on the good cooperation between the German University of Technology in Oman (GUtech) and leading Universities of Technology in Germany. Prof. Dr. Gösta Hoffmann from the University of Bonn is the leading scientist of the current expedition. He has been teaching and researching at GUtech for many years and he is the main author of a recently published book on the Geology of Oman: “For me it is a pleasure to invite my colleagues to visit Oman. It is such a beautiful country where certain rock formations allow us to understand how our planet works. Such places are unique in the world and most of them easily accessible in Oman. For example, the country is blessed to offer the opportunity to study the transition between different layers of the Earth. Usually these rocks are not to be found on the surface but they are in Oman.” Furthermore, Prof. Hoffmann lined out that Oman has a very rich archaeological record. This proofs the very long history of the country. 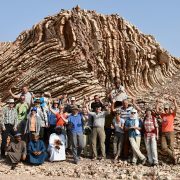 “The benefits to come to Oman and explore the mountains, deserts and coasts are that Oman is a safe country and the geology is spectacular,” said Prof Dr. Martin Meschede, President of the Umbrella Organisation of Geosciences (Dachverband Geowissenschaften, DVGeo). The German Geological Society (Deutsche Geologische Gesellschaft – Geologische Vereinigung: DGGV) has about 3,600 members from universities, industry, and private economy. Prof. Dr. Martin Meschede pointed out that a trustful local partner is necessary to operate such fieldtrips: “The logistic part of the trip is organised by Golden Highlands. This company has a long experience in conducting these trips for us.” In addition, in a joint effort, the participants of the field excursion together with the local partners from Golden Highlands cleaned the beach at Ras Ruawais in Ash Sharqiyah region from garbage left behind by other visitors. “It is our ambition to keep the country clean so that our visitors go back home with positive impressions. It was a memorable experience to run this clean-up as a joint effort with German professors,” said Mansoor al Shabibi the CEO of Golden Highlands while adding: “We plan to clean other places with other groups in the future. One of the most beautiful places is Wadi al Abbyad. We will also check the situation in Ras Ruwais and clean again in the future if necessary.” Prof. Martin adds that the situation already improved a lot:” When we first visited the place a couple of years ago, it was much worse.” Prof Gösta concluded that it is worth working together to preserve Oman´s natural wonders for future generations. Group photo: Twenty members of the German Geological Society from various universities and research institutions are currently visiting the Sultanate of Oman. 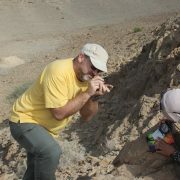 The group is headed by Prof. Dr. Gösta Hoffmann, Geoscientist at University of Bonn. HALBAN The German University of Technology in Oman (GUtech) will launch a part-time Master’s programme in Applied Geosciences in September this year. “The programme in Oman focuses on an area which is of key importance to the region’s present and future: Energy, water and mineral resources. A strong emphasis is placed on the employability of our graduates. Many elements of the programme will be accomplished in cooperation with local and international partners from universities in Europe, e.g. RWTH Aachen University and companies in the region” said Prof. Dr. Wilfried Bauer, Head of the Department of Applied Geosciences. The degree programme will be taught in English, including written and oral tests, seminar papers and the Master thesis. The programme may offer the opportunity to travel to Europe to complete coursework at RWTH Aachen or any other University in Germany. “Numerous mineral resources have been found in Oman, such as copper, chromite, and manganese but the country has also vast resources of industrial minerals. Currently, more than 250 mining and quarrying operations are active; their production accounts for 33% of Oman’s total non-oil exports. In this booming environment, and taking into consideration that exploration for non-hydrocarbons is still at a very early stage, the job opportunities for graduates specialized in mineral resources are considered as very good,” said Prof. Wilfried, who is specialized in mining and who has taught in Germany and Madagascar and was active in geological mapping and exploration for the British Geological Survey and private companies. Applied Geosciences graduates are also involved in the petroleum industry in the Middle East and elsewhere. This trend is likely to continue as advanced technology is needed to exploit this non-renewable resource. Well-trained and highly motivated geoscience specialists will be on demand, despite the recent economic downturn and the decreased oil prize. Water is a highly important topic in water-scarce countries in the Gulf region. In Oman the water resources management is lead by the Ministry of Regional Municipalities and Water Resources (MRMWR). 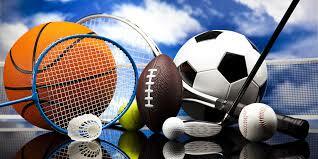 Moreover, big commercial activities, e.g. for oil and mining companies as well as large industrial producers, mostly have aspects related to water and thus require experts in that field. The first three semesters focus on fundamental skills needed for Applied Geosciences in general and they give an overview of the three electives: minerals, water and hydrocarbons. Semester 4 and 5 will integrate the material presented earlier by focusing on advanced applications of these skills in the specialisation PGEO (petroleum geosciences), HGEO (hydrogeology) and MGEO (mineral geosciences). 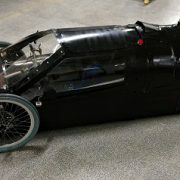 It is during this stage that students have to complete two project modules, including a practical project and the MSc project, either nationally or internationally. 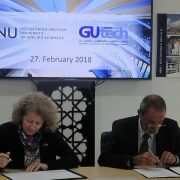 (c) GUtech/Text: Dr. Manuela Gutberlet and Prof. Wilfried Bauer; Photo: GUtech/ AGEO Dep.